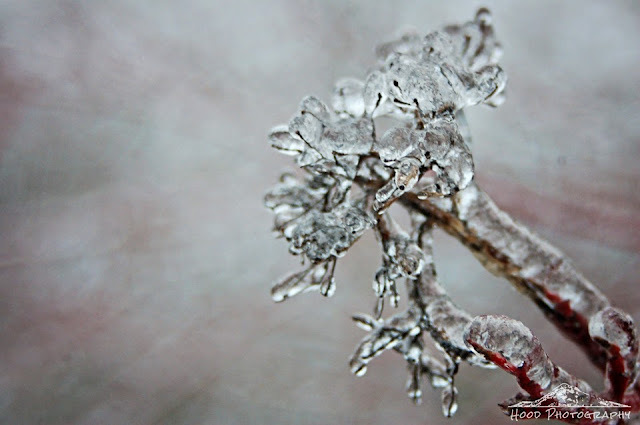 Sarah Bettey Photography: Delicate Ice "Flower"
I am about done sharing the photos I took over our recent icy, snowy weekend. It is weird to think this was what things looked like only a week ago. The temperatures are almost 25 degrees higher now than then! I really liked this one. It is the left over branches from a cluster of berries I assume, but with the ice covering it all, it almost looks like a flower. All of natures ice sculptures are beautiful and your recordings of them are splendid ... I am surprised to hear you say that wintery weather is not common in your area. I would have thought otherwise, but perhaps the mountain ranges protect you from it. Bless that little brave Crocuse ... if it didn't get stepped on it probably did survive the cold and ice ... mine do every year, but they don't come up in February. Splendid are the first signs of Spring ... I am so looking forward to the end of this long, bitterly cold winter. A gorgeous shot! So beautiful! Calling by from iheartmacro, love this one. Ice does create beauty wherever it lands on. That is a neat perspective! It does look like a delicate flower. Great picture! It does really look like a beautiful ice flower!